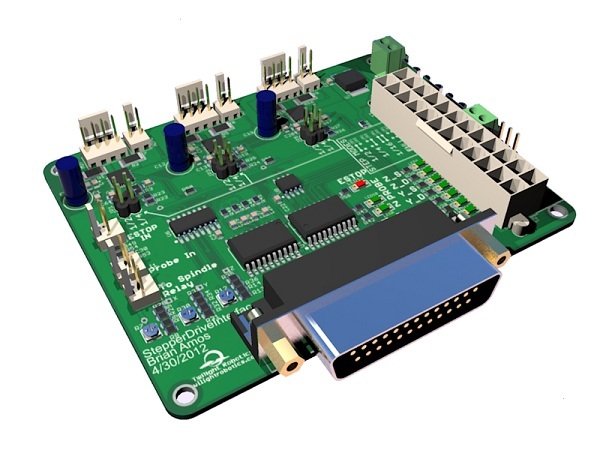 Bearmos designed a 3-axies CNC stepper motor controller. It has a ATX connector, allowing it to be powered from a computer power supply. The motors are driven via onboad driver chips, while commands are received from the computer Via the parallel port. This board is mainly designed to be inexpensive, have lots of indicators for showing what’s going on (making troubleshooting a bit easier). It includes integrated driver chips (not modules that need to be purchased at $15 ea), which should also help out with heat dissipation. The only (relatively) novel thing about this design is that it includes some circuitry to automatically reduce the current (~1/3 of “active” current) to the stepper motors after they’re inactive for a period of time (probably around 1 sec). A small PIC, an analog mux, and a resistor network are included to take care of this task. This entry was posted on Tuesday, October 23rd, 2012 at 7:00 pm	and is filed under project logs. You can follow any responses to this entry through the RSS 2.0 feed. You can skip to the end and leave a response. Pinging is currently not allowed. 3x $15 for drivers is almost twice the price of ready made chinese controller based on Toshiba chips. Observe the use of the word “not”. and this parallel port with require an usb converter to work with quite a lot of modern computers. I’m no expert in this area, but I don’t think that anyone recommends the use of a USB-to-parallel converter for interfaces like this because of their timing non-determinism. You either get a real parallel card or an older PC that has one. This is still the reality for DIY CNC — parallel port FTW. The days are definitely numbered though. He *did* say that low-cost was one of the primary design drivers. I think that something like GRBLCNC is sooner (hopefully) or later the way to go — offload the control onto the driver board and bail on the PC.